Within hours after a published report by Los Cerritos Community Newspaper that outlined specific details of a controversial contract between the City of Huntington Park and its longtime powerful city attorney Francisco Leal, the formal relationship between the two entities was officially dissolved on Tuesday. 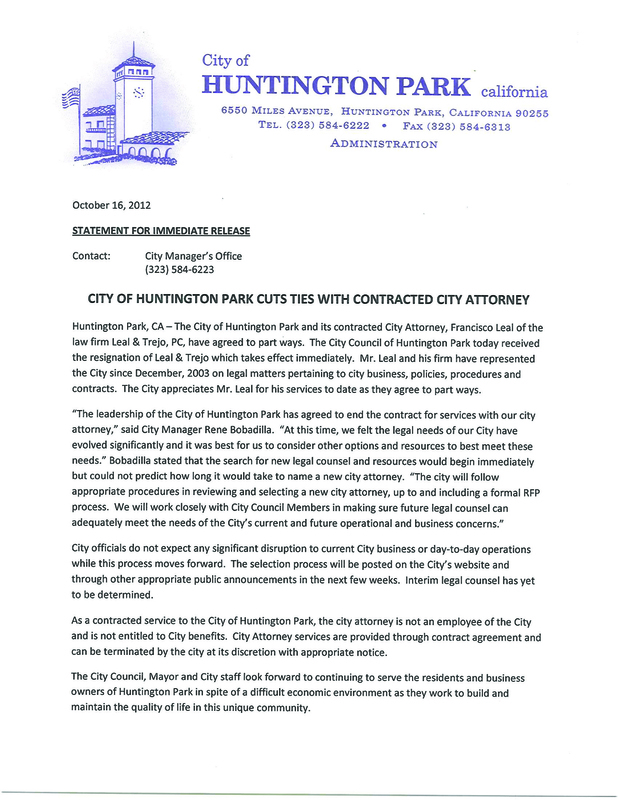 “The leadership of the City of Huntington Park has agreed to end the contract for services with our city attorney,” said City Manager Rene Bobadilla. Bobadilla stated that the search for new legal counsel and resources would begin immediately but could not predict how long it would take to name a new city attorney, up to and including a formal RFP Process. “We will work closely with city council members to make sure that future legal counsel can meet the needs of the city’s current and future operational and business concerns.” he said. Interim legal counsel has yet to be determined. Los Cerritos Community News published the contract between the law offices of Leal and Trejo on Tuesday afternoon and reported that taxpayers in the cash starved city could be on the financial hook to legally defend LA County Assessor John Noguez in any possible criminal charges he may face in the future, including the ongoing massive political corruption probe at the LA County Assessor’s office. Leal, who is the main legal counsel with the firm, came under public scrutiny Monday night after angry residents served formal recall notices on all five city council members. Leal & Trejo’s legal service rates ranged from $180 per hour not to exceed $30,000 per month, and “special legal services” that shall be billed at $250 per hour with no limitation on a monthly amount, LCCN reported. A closer inspection of the scope description reveals possible loopholes that can allow Leal to defend Noguez, who is a former city councilman and mayor. Noguez is on a formal paid leave of absence from his responsibilities as Assessor of Los Angeles County and is the central figure in a massive criminal probe that is centered on bribery, forgery and money laundering allegations. Many observers say the “former City officer or employee loophole” gave Leal permission to defend Noguez in any possible future criminal trials. Noguez was a Huntington Park City Councilman and Mayor between 2005-2010. Reactions poured into Los Cerritos Community Newspaper from some of Leal’s biggest detractors just hours after the decision was made public. “The problem is not over with the City Attorney’s questionable resignation. The problem of the City still remains in the five remaining City Council members who have mismanaged, misled the City, and will continue to do so if not removed quickly from office,” said Amezquita. A local website www.watchourcity.com has been reporting on the political climate surrounding Huntington Park City Hall and other local municipalities for the past decade. “The problems with the City leadership and related contracts like the City Attorney and others have gone on for far too long,” the Editor for the website told LCCN. Los Cerritos Community Newspaper will have additional details on this situation on Wednesday.